The Mission of TaiChiTeacher.ORG is to provide simple, direct, and comprehensive training in Movement and Mediation Arts. 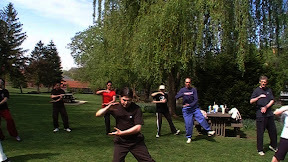 Our schools include popular the arts of Tai Chi Chuan, Yoga, and Qi Gong, and several lesser known styles such as the Internal Martial Arts of Ba Gua and Hsing Yi. Our continuously evolving regiment incorporates the findings of western researcher and nearly three decades of personal study to provide the safest and most effective training possible within our core arts. TaiChiTeacher.ORG is an extension of the teachings of Bruce Hutchinson, a Teaching Master in three systems of energy based healing, Licensed Massage Therapist, and Certified Personal Trainer.He has been a formal student of the martial arts for over 25 years, and has taught under his own name for over 15. Master Hutchinson's involvement in the area's internal martial arts began in 1992 when he became president of the orignal Tai Chi Club on Penn State's University Park Campus. His teaching credentials include Bellefonte, State College, and Moshanon Valley YMCAs, The Central Pennsylvania School of Massage, and Young's Tae Kwon Do. Some of his other programs have included wellness programs for Altoona Regional Health System employees, Highmark Blue Cross subcribers, and The Pennsylvania State University employees.